I have to ask myself... has it really come to this? Has human life become so worthless that we could actually have an internet poll to decide if a child should live or die? Is the idea of wanting a family and having children so obsolete... that we would take it so lightly... and we would ask the advice of perfect strangers who have no interest, no concern, no investment and would not be affected if the child lives or dies? Apparently so. I just heard the story of a couple who is doing just that. In the article Apple Valley couple asking world: birth or abortion? - TwinCities.com, it talks about the 30-year-old couple who are undecided about giving birth to their baby boy, who is now at 17-weeks. 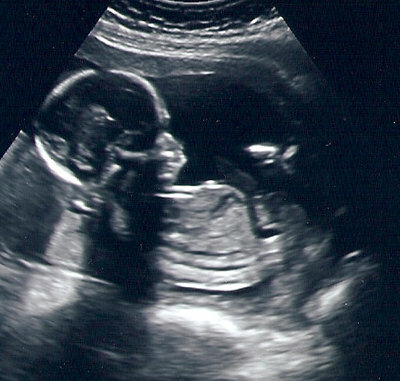 They have posted ultrasound photos.... detailing his progress and even calling him "Wiggles". They see this precious child and yet they are still asking the public if they should let him live or abort. I find this incredibly disgusting. Are we so far from family values that there is no longer the parental instinct to protect your child from all harm? To keep him safe and do your best for him? Have we really become so selfish that a child is no longer a blessing... but an inconvenience? So selfish that we would lay down the life of an innocent child to make our own more comfortable? God help us! I pray for this couple and their unborn child. For salvation, wisdom, knowledge and the courage to do what is right. They may be the first to put a poll on the internet, but I doubt they are the only ones to feel and think this way. We need to pray diligently for the future generations. Will you pray with me? Labels: An Article To Share, My thoughts. Oh, Lord help us. I will pray. Thank you, Mary. Prayer is powerful!